Going for a job interview dressed in jeans and a casual tee? One of the biggest mistakes that you can make! Although the working environment in an advertising firm is relaxed, you cannot take the liberty of dressing up casually for the interview. This dressing style can make you come across as unprofessional and can cost you the job. Remember, you can never go wrong wearing a perfect black suit to an interview. French cuff shirts are not only modern and trendy, but are a perfect combination with a suit. Moreover, they are the best choice when paired with cufflinks. White French cuff shirts are preferred as they look good with dark as well as light coloured suits. Wearing a French cuff shirt without cufflinks? French cuff shirts are designed for cufflinks. Look for a trendy and classy pair of cufflinks to wear to your job interview. If you’re wearing a black suit, silver metal cufflinks will look good; gold metal will look good with light coloured suits. Whichever colour you choose, just make sure that your cufflinks complement your attire! With dozens of collar styles available in the market, it is difficult to decide which one you should opt for. While it’s a personal choice, the only thing we recommend is considering your face structure. For instance, a narrow point collar will not look good on narrow faces. Instead, wide collars will look good and balance the overall look. Not wearing a tie with a suit is like a meal without dessert! It’s not essential; but it’s definitely the best aspect. 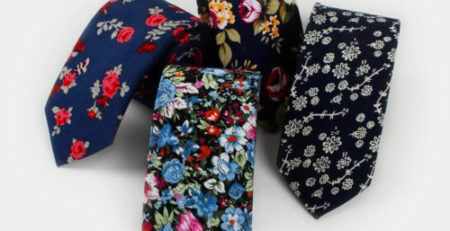 Choose a tie colour and pattern that complements your outfit. Keeping up with the new trends, you can choose a classy skinny tie. Another tip to spice up your suit is adding a pocket square. Your interviewer will certainly be impressed with your dressing style! Leave that ever lasting impression on your potential employer by adding sophisticated ties and modern cufflinks to your outfit! Get the perfect cufflinks and trendy skinny ties at AusCufflinks. Our store has a wide collection of some of the best cufflinks and ties online!